Mackay Transit Coaches has been operating within the Mackay Region for over 25 years. We specialise in providing safe, quality, comfortable transport solutions and experiences to a range of public and private sectors including resource and mining, local schools, corporate organisations, local tours, and general charter. 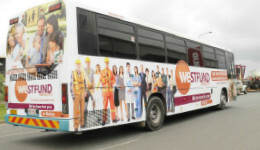 Over the years Mackay Transit has worked tirelessly alongside the Department of Transport and Main Roads to provide professional, efficient transport services to connect communities and individuals across the region. Our state-of-the-art fleet of over 70 vehicles is the latest in road transport engineering and design, equipped with state-of-the-art technology and crafted for comfort, safety, durability, and efficiency. Our experienced and professional drivers are dedicated to getting you where you need to be, when you need to be there. Mackay Transit Coaches is not only an integral means of transport within the Passenger Transport Industry: we also pride ourselves on our community contributions. Our team consists of over 80 local staff and as an equal opportunity employer, Mackay Transit Coaches provides jobs for any and all who share our passion for making community connections. We make it a priority to provide both goods and services to charity organisations and schools throughout the region. We use the skills and enthusiasm within our local community resources whenever possible, because no one else does it quite like our local community! The Mackay Transit team is passionate about providing dependable, professional, and memorable transport solutions for any and all of our clients.